"How do we mourn?" I was immediately struck with that question because I feel so much of being an artist, at least in my own practice is the ability to mourn creatively. I once had a reading by artist Asher Hartman who read my chakras and told me he had a vision of a large black bird lifting me in its arms and stuffing red, gold and black flowers into my mouth. This image was a little disturbing to hear to say the least, so i went home and looked up the meaning of a black bird as a symbol and across the board it seemed to be a messenger of bad times, suffering and death. 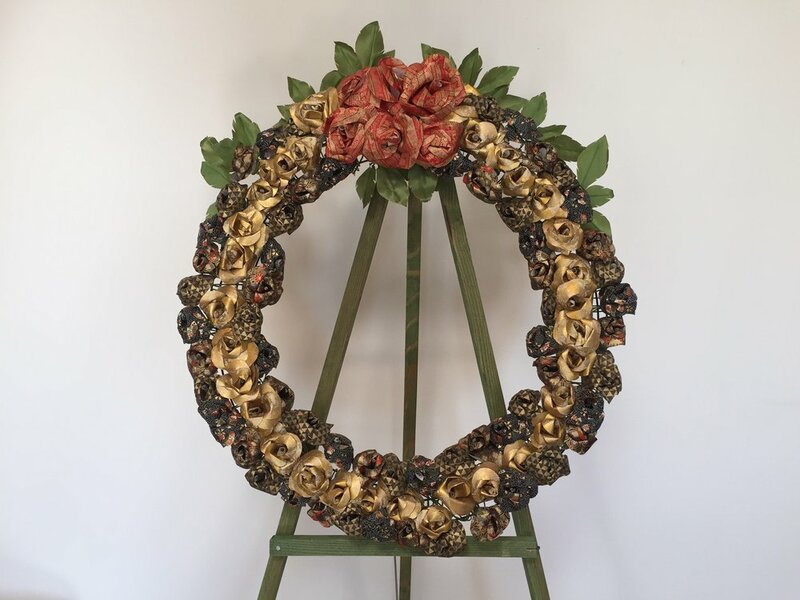 I sat with this for a while and then slowly it dawned on me earlier in the year that I had made several paper flowers, gold, red and black roses to be exact, ...out of paper. I made these flowers as part of an altar piece dedicated to my own family who had recently passed away and who were Japanese Incarceration camp survivors. I had gone to the Japanese American National Museum library and found an archived Woolworths flower making pattern they used in the camps to make flowers for deceased love ones who passed away while incarcerated. Since real flowers were not readily available, communal paper flowers were made when some one passed on. The vision of a black bird stuffing flowers into my mouth then became clear to me that this black bird was nourishing me in the manner birds feed their young. The bird stuffed my mouth full of inspiration rather than bugs or insects. As an artist, I was inspired by my painful ancestral past and was able to take that pain and turn it into art and creativity - the floral wreath for my family. I went on to teach that same flower pattern in many workshops and exhibitions as well. As an artist, I was inspired by my painful ancestral past and was able to take that pain and turn it into art and creativity - the floral wreath for my family. So I was also struck by Master Ohi's inclusion of the crow in his lecture. I also remember reading an interview a while back with Takeshi Murakami who also mentions how artists need to be "necromancers" or maintain a connection to the afterlife. He was talking about his paintings referencing deities I think but it still stuck with me in the same way as well. So in that way I think the way artists and creatives mourn is by turning something painful and awful into something like art, or something beautiful, healing and transcendent. Shizu Saldamando is a Los Angeles based visual artist whose work centers on subculture and perseverance. She received her B.A. from UCLA's School of Arts and Architecture and her MFA from Calarts. She has done residencies at CanSerat in Barcelona and ArtOmi International Artist Colony in upstate New York. Her work has been featured at the National Portrait Gallery in Washington D.C., LACMA (as part of the Phantom Sightings Exhibition), and the 2015 Venice Biennial as a part of the official collateral exhibition “We Must Risk Delight”. She has had solo exhibitions at the Vincent Price Museum, Moore College, Steve Turner Contemporary and most recently a permanent display of her work at the Palms Metro Station as a part of the new Expo Line extension. She currently has work up at the Petersen Automotive Museum in the “High Art of Riding Low” , and as a part of the Getty LA/LA series, at the Japanese American National Museum, the Lancaster Museum of Art, Chapman University Gallery and Self-Help Graphics and Art. She has worked on staff for various non-profit arts organization and currently works as a tattoo artist. She is also a mother to a one year old.